The Corsair HX range of power supplies kickstarted the company's move into premium PSUs back in 2006. The range survives almost 10 years later and is now equipped with higher-performance internals, better aesthetics and improved cabling. 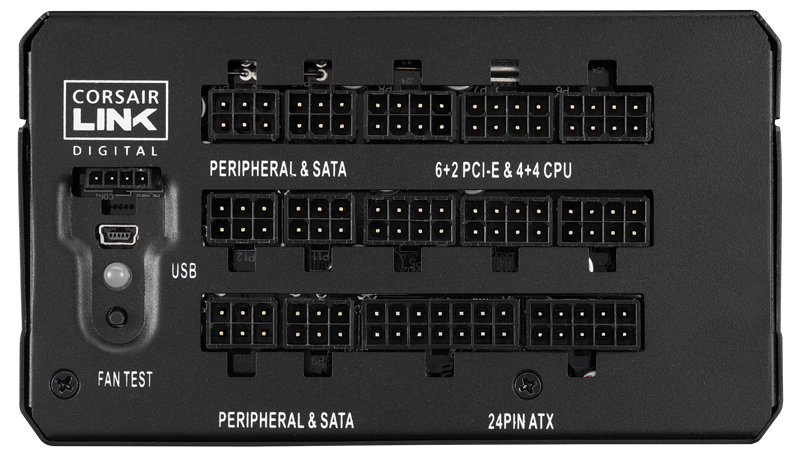 Yet Corsair has realised that PSU segmentation is key in having a diversified portfolio. There are a number of ranges that overlap one another in terms of price, albeit differentiated with respect to capacity, features and performance. One of the latest entrants to this ever-growing list is the HXi range that sits just below the range-topping AXi. Both sport 80 PLUS Platinum-rated efficiency, feature all-Japanese electrolytic capacitors, are compatible with Corsair Link software, and can shunt all their capacity down the 12V line at a toasty ambient 50°C. HXi is a little cheaper, relatively speaking, and we'll explain why. 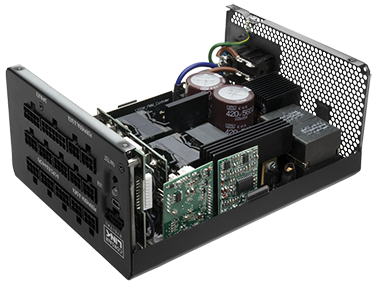 The AXi uses fully-digital power regulation that's controlled by a dedicated digital signal processor. This means that voltage regulation is super-tight and vastly more configurable than most other supplies. The HXi, whilst almost as good, does without, but uses a DAC to enable aforementioned Link compatibility. 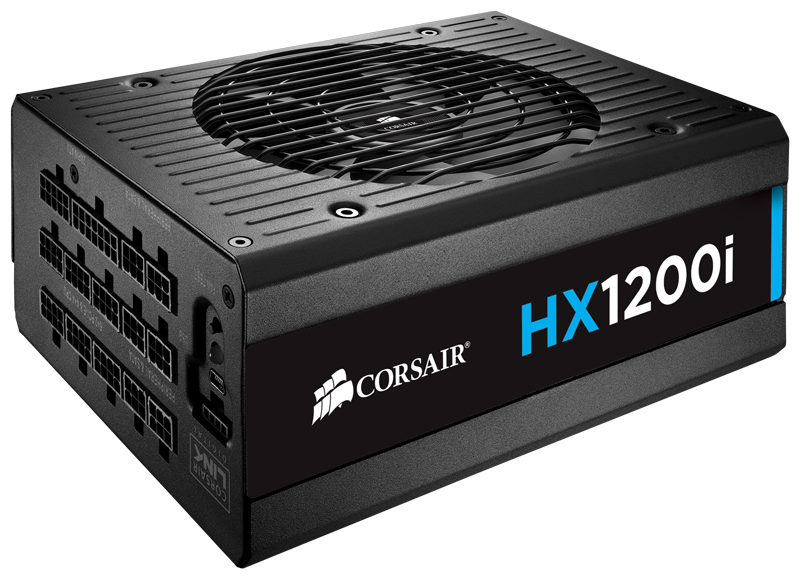 In a nutshell, the newer HXi range represents a premium range of PSUs that, according to Corsair, are just a shade less precise when tested with specific equipment. 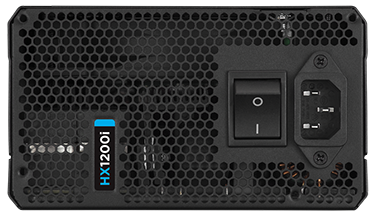 The financial difference is greater, mind, as the HX1200i costs £200 while the equivalent AXi model £250 or so. 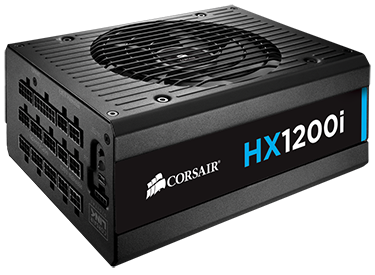 HXi is available in 750W, 850W, 1,000W and 1,200W capacities, and Corsair uses a roomy chassis for all. 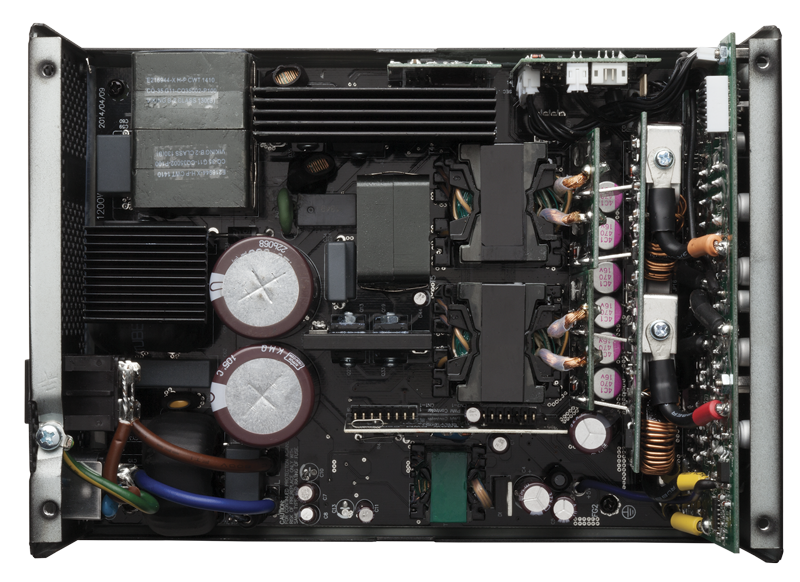 The biggest of bunch, the reviewed 1,200W, is 200mm deep, so do check your chassis to ensure it fits fine - though, truth be told, if you're looking at this kind of PSU, capable of powering ultra-high-end builds, room shouldn't be an issue. Width and height come in at a standard 150mm and 86mm, respectively. It's a chunky beast, too, weighing in at 3.6kg. 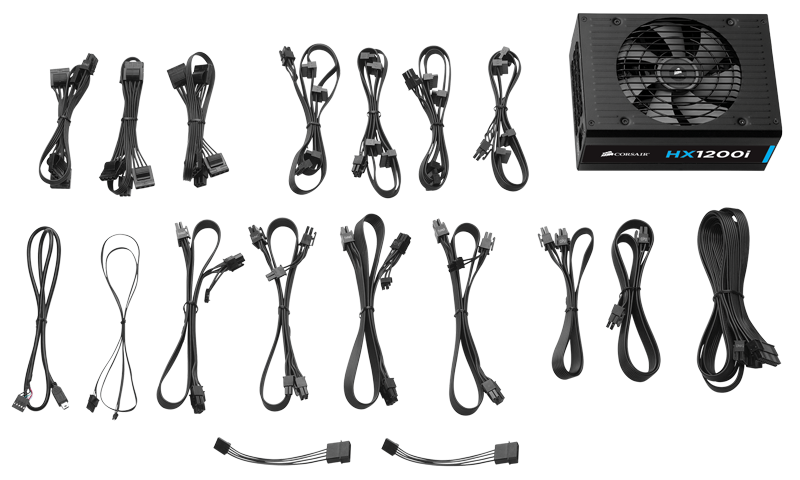 Presentation is slick and the supply looks good; Corsair has homogenised its PSU line-up so that ranges do appear similar on first glance. 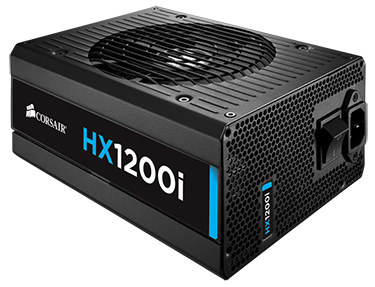 The HX1200i's size enables the company to use a 140mm fluid dynamic-bearing fan that only spins when needed. In keeping with other premium supplies, the HXi is completely modular, meaning you only connect the cables you require. 14 separate connections service the supply's flat, modular cabling which is easy to manipulate through the regular cutouts in most chassis. The main ATX connector covers the two bottom-right ports and there's enough concurrent cabling to power a nuclear reactor. All in all, Corsair provides 12 SATA connectors, 12 Molex, 8 PCIe (handy for quad-GPU running), and two Floppy. Note the USB input? It's used to communicate with Corsair's Link monitoring software, while a fan test button is, funnily enough, added to reduce RMAs. Corsair says the supply's zero-fan mode during light use can fool some users into thinking that it's not working (which is intended) so a quick press of this button makes the 140mm fan spin momentarily. The zero-fan mode is rather useful for low-noise aficionados because the high efficiency associated with Platinum-rated supplies produces so little heat. Indeed, the fan doesn't turn on until almost 500W is delivered to the PC, meaning that even Titan X SLI-bearing systems will barely tickle the need for the fan to turn on: impressive if you like quiet, powerful builds. 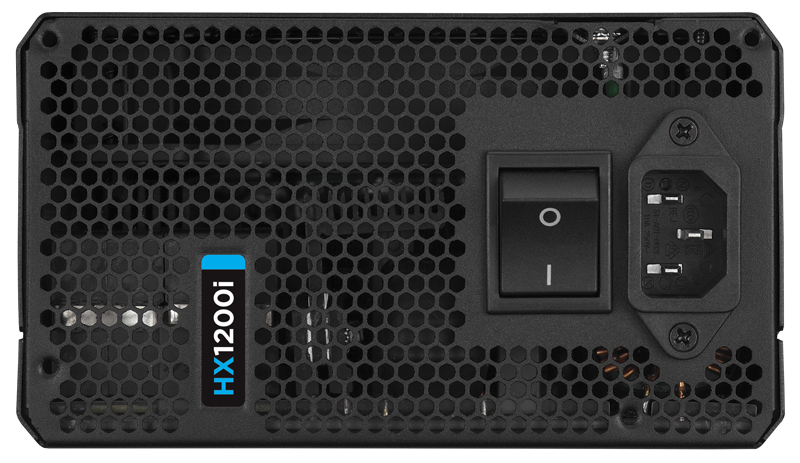 Inside, Corsair extends the partnership with OEM-maker Channel Well Technology for the HXi supplies. Soldering is very good for the main PCB though not quite as perfect for the slot-in cards. Six Y capacitors, three X capacitors, two coils and the usual bridge constitute the first-line filtering. Nippon Chemi-Con is the go-to provider for both the primary and secondary electrolytic capacitors. Enesol and Apaq, meanwhile, provide the polymer caps. We reckon a little internal reorganisation could reduce the chassis length to, say, 180mm, but there's really little need to do so for the intended market. As usual, a DC-to-DC design means that the smaller rails are fed off the main 12V, whose capacity is the same as the total available on the PSU. It would take a rather gargantuan build to eat up the 1,200W of 12V power available on this model that's backed by a seven-year warranty.